The contract has been signed and now I can officially say that in June-July 2018 I will be teaching a 6 credit photography class in Florence, Italy. The class is titled "City as Studio-Florence 2018"
A unique photography course that uses one of the most vibrant European art metropolis as both a subject and a sounding board for image making. The traditions of documentary and street photography will be our primary guide. Daily on site group trips in and around Florence as well as day trips to Siena, Lucca, Pisa and other cites in Tuscany. Emphasis on developing a portfolio of images that reflect a more concise, well reasoned portfolio. 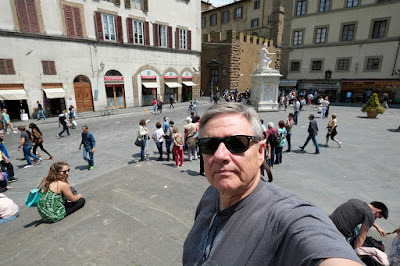 Florence, a city often described as an open-air museum, will be the base for our investigations. Students will carry out research for project-based work in museums, churches, piazzas and markets of Florence and will be supported by lectures and technical demonstrations. This course is open to students of all levels and disciplines, students need to supply their own camera and support systems. Students may employ either analogue or digital media during the class and an on site darkroom will be available for film processing and printing. This will be the trip of a life time so start planning for it now! More details to flow so stay tuned!